Many times you know a split second before it happens. You feel helpless. Perhaps even yell out "NO!!" Then it permeates the air. You choke. Your poor dog is yelping, running straight for the door to get back inside. What are you going to do? Run to the store to buy an expensive product? Tomato juice? No. 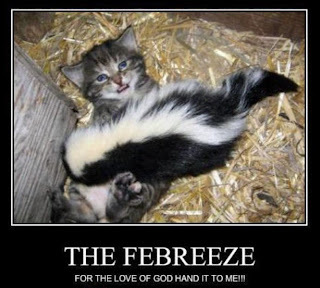 Febreeze? No. Repeated baths? No. The solution? Make your own vet recommended wash. Mom reminded me of this today. 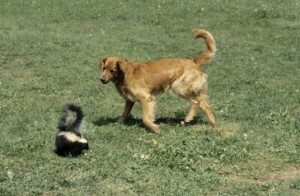 I have no idea how our conversation even ended up on skunk smell. Sometimes our conversations go in very strange directions. But we're both eccentric so that's okay. Several years ago a vet recommended this combination to us and then recently another vet recommended it to my Mom when her dog got sprayed. She was smart enough to write the recipe down. Thank you Mom! No, my dogs didn't get sprayed. I worry though because every once in a while I get the pungent aroma of skunk in the neighborhood. I don't lie to myself and think it will never happen to my dogs. That recipe is enough for a medium to small dog. For larger dogs double or triple the recipe. You can also use it on yourself, floors, laundry, furniture. 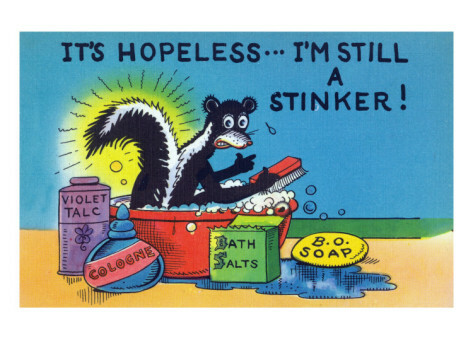 Whatever else might have been in contact with the skunk oil. Not mine but really cute! A little side story about skunks. The house we lived in before moving to Texas was in the country. There was an opening under the house where a new addition had been added. We had stray cats. Two of them. They stayed under the house. We fed them and they began to like us. There was an old shed at the beginning of the driveway. There was a family of skunks that lived under it. The owners decided they were going to get rid of the skunks. It was horrible! The smell they caused by their methods took a long time to go away. I couldn't go out and wash the trees, grass and whatever else had been sprayed. Anyway. One skunk had been missed. I'm sure it was a female. I never got close enough to check but one night when I stepped out the front door to feed the stray cats she was there. Waiting to be fed too. I was a little scared but she didn't try to spray me. I quickly put the food down and backed inside the door and shut it as fast as I could without scaring her. Sometimes when we came home at night she would be there. I was always afraid to just walk by her so would wait for her to go under the house. She never sprayed. One day one of the strays came into the house. She wanted to have babies. Oh dear. She had 7 of them! We took care of them and found them all homes. (But they got fixed first so no one else would have the problem.) As the kittens grew their Mom wanted to take them outside to teach them how to hunt. We would let them go. I would always worry about their well being but I really didn't need to. Mom was a great hunter and they had a nanny for when Mom wasn't around. 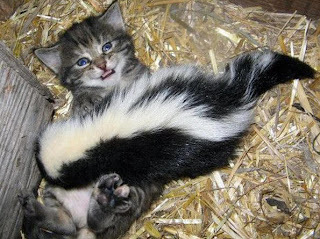 The skunk. I really wish I could remember what we named her. Daisy maybe. So the kittens when they would get cold or tired would go under the house with Daisy and cuddle up with her until Mom came home. When we let them back in the house they never smelled of skunk. Just wild animal. I think skunks are very cute. Maybe it's because we have the same hair coloring. That was it!!! Thank you Mom. The skunks name was Gloria. It is really amazing! I have done the same thing with tomato juice so was so happy to have discovered this. I'm glad you found it and I hope you never need to use it.